This technology has been in common use in hotter climates since the 1920s. It is a relatively low cost way of collecting solar energy to heat hot water. Pioneers of solar energy used old radiators painted black which is much the same principle, now available in more sophisticated and efficient forms. 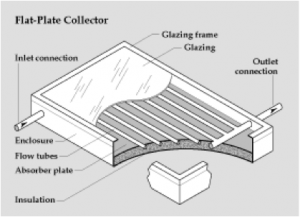 A flat plate collector consists of a thin absorber sheet (of thermally stable polymers, aluminium, steel or copper, to which a black or selective coating is applied) backed by a grid or coil of fluid tubing, all held in an insulated casing with a glass or polycarbonate cover. Fluid is circulated, using either mains or solar electricity, through the tubing to remove the heat from the absorber and to transport it to an insulated water tank, sometimes directly, or to a heat exchanger, or to some other device for using the heated fluid. In the EU now there are several companies producing these types of collectors from polymers, which reduce the risk of the collector cracking in freezing weather conditions and able to contain plain water rather than antifreeze, thus allowing the water to be pumped directly into your existing hot water system.